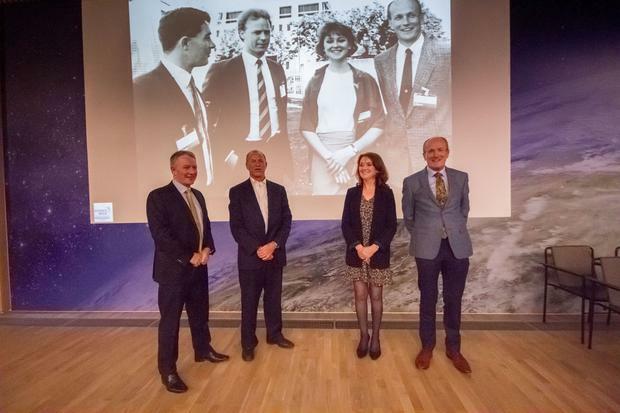 Twenty-seven years after they set off to join the space race, Ireland's four would-be astronauts were reunited in Dublin recently, a little older, but still doing what they were doing when they were recruited for the European Space Agency project in 1991. Willie Butler, originally from Kilkenny, was a captain with Aer Lingus, then and now. Kevin Barry from Dublin, who was a captain in the Air Corps, is now with Virgin Atlantic. Professor Ciaran Bolger, also a Dubliner and then a junior doctor, is now a neurosurgeon with Trinity College and Beaumont Hospital. And Deirdre McMahon, also a medic, originally from Belfast, is now an anaesthetist living outside Paris. As they recalled six months of having hot and cold water poured into their ears, withstanding blood-curdling G-forces and endless psychological tests, Deirdre McMahon recalled that they got on well "because we had the gift of the gab - we were more sociable that most of the other European candidates". The four were picked to compete with hopefuls from around Europe for a place on the proposed European Space Agency's 'Hermes' project, a space shuttle that would put the continent into the space race with the USA and the then USSR. "It was our first hope for Ireland to have its very own astronaut in space," recalled Dr Niamh Shaw, of the Blackrock Castle Observatory in Cork, who began the quest to find out what happened to Ireland's only space mission. She tracked down the four intrepid space travellers through old newspaper clippings and an appearance on RTE's Saturday-night TV programme, Kenny Live. The scientist and space enthusiast then spent four years trying to find the intrepid four, who were identified from hundreds of wannabe space enthusiasts as having "the right stuff". "They just disappeared from public view, as did their incredible story," she says. Eventually "desperate for help" she made a public plea on RTE Radio One's The Ryan Tubridy Show last February, and, within days, found out where they were and what they were doing. They were finally reunited at an event in the Royal College of Surgeons last Thursday night, where they spoke about their experience for the first time. All four recalled their varying reactions to seeing an advertisement in the newspapers, placed by Dr Ann Saunderson of the government-backed science and technology agency Eolas, for Irish candidates to take part in the European Space Agency's Hermes project. For Deirdre McMahon and Willie Butler, it was "the dream of a young kid brought up on Apollo" to go into space. Kevin Barry said he was "really keen" while Ciaran Bolger had a nonchalant, devil-may-care attitude. There were 700 applications in all, and the four were selected from 250 candidates. "When we got to Cologne in Germany and met the others, we found that they looked on you as a competitor - we were just sociable and enthusiastic," says Ciaran Bolger. They described the rigorous and invasive testing that went on for months. Ireland was only contributing 0.05pc of the space programme's budget, and the Irish candidates realised their chances were diminishing rapidly when the French and Germans brought in highly qualified pilots from their own astronaut programmes. Although the Irish were the most successful group on the panel and were included in the final shortlist, none of them made the final cut. "I was very annoyed at the time," recalls pilot Kevin Barry, "but then I had to do a flight for the Air Corps in the afternoon and I just got on with it." Deirdre McMahon was ruled out because of a minor heart issue. "Willie [Butler] and I got through to the very end, but it was clear to me we were never going to be selected; it was pre-determined for other nationalities," said Ciaran Bolger. Ultimately, the Hermes programme was cancelled because it turned out to be too expensive although some of those they trained with did go to space when the European Space Agency began co-operating with the Russians on the International Space Station programme. Dr Niall Smith, of the CIT Blackrock Castle Observatory in Cork, told last week's gathering that billionaires were now replacing national agencies as financiers of space exploration. He told an enthralled audience that Ireland is an ideal place to launch 'space tourism' - but even more importantly, that the government should be looking at the possibility of 'space broadband'. "Instead of digging up every road and boreen, they need to use space technology; it already exists, and Irish companies could get involved," he said. For the four Irish astronaut hopefuls it was a dream never to be fulfilled, but when they were reunited they had plenty to talk about and the intervening 27 years showed that they had lost none of the gregarious good humour that carried them through a difficult, if fruitless, space mission.